In 1985, while living on our farm in Olympia, Washington and raising Black Angus cattle, my husband, Ron and I decided to try our hand at sheep. We started with 30 Polypay ewes and a Dorset ram, and in 1986, on a trip to Zimbabwe, Africa, we discovered hair sheep. Ron learned of a 500 acre effluent spray field in Ft. Walton Beach, Florida, in need of a manager to implement a rotational grazing plan, and use livestock to remove the grass. In 1988, we sold the Angus cattle and moved to Ft. Walton Beach to manage the spray field. We bought 1000 head of stocker/feedlot cattle from south Florida, 400 Barbados Blackbelly from Texas, and 125 St. Croix ewes from Texas A&M, Dr. Maurice Shelton. We enjoyed the people and weather of Florida, and in 1991 purchased 56 acres in Williston. We kept 100 of the very best Blackbelly and St. Croix ewes, and brought them to “Calovine Farm.” For the next 8 years we raised Blackbelly, St. Croix, and added Katahdin to the flock. In 1999, we were introduced to Dorpers and were very impressed with the scale and temperament of this breed. Ron, a PhD in American Studies, but a farmer at heart, began work on a cross between the Dorper and the St. Croix. The St. Croix, superior to the Blackbelly and Katahdin in mothering abilities, parasite resistance, and hardiness, were also flighty, slow growing, and small framed. 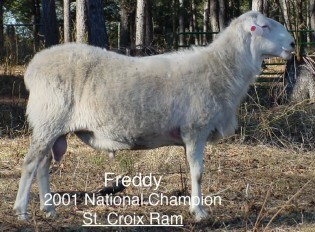 The Dorper breed provided a larger, heavier muscled frame to produce a meat sheep cross that would do well in hot, humid Florida. 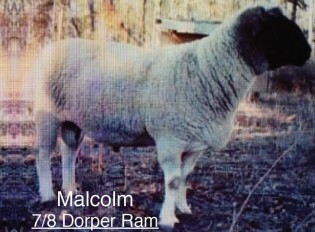 In 2000, Ron went to Sedalia and bought “Malcolm,” a 7/8 Black Head Dorper ram bred by Broadmead Riverwood Farm in Powel, Ohio. Foremost in the development of the St. Augustine was productivity, and at Calovine Farm that focus continues. Productive ewes are early maturing, have multiple births, have excellent maternal ability, and can perform well in an accelerated lambing program. Secondary selection was for hair coat, resulting in some individuals having a permanent wool/hair coat along the back and sides. Selection should be away from non shedding coats. St. Augustine are medium sized with a medium sized frame. Being bred and managed in Florida, they are well adapted to hot, humid climates and have good parasite resistance. They are easy to handle, with good flocking instinct. As excellent foragers, mature ewes and rams do well on coastal/bahai grass pasture. Ewes are deep bodied, able to produce multiple births with ease. 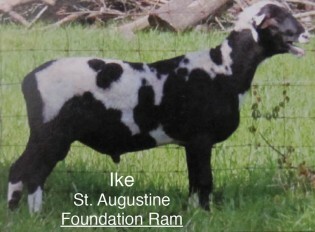 Rams are fertile during hot summer months when other breeds are sterile. Dressed carcass percentage on St. Augustine market lambs is 50%, and meat is mild in flavor. Head shape and appearance will vary. A roman nose in rams and ewes is common and acceptable. Ears should be medium to large in size to promote cooling. Most will have a wool/hair coat that sheds, however, some will have a permanent wool/hair coat. Color: The St. Augustine may be any color, color combination, or color pattern. Hair Coat: There are three coat types. Hair coat with no permanent wool fibers present; short wool/hair combination staple that sheds; wool/hair combination that does not shed. Selection should be away from non-shedding coats. Horns: Polled is preferred, and horned or scurred animals are recorded as such. Hooves: Color can be black, white, or a combination of the two colors. With good care, ewes lambing annually will produce a 190% lamb crop. In an accelerated lambing program (lambing 3 times in 2 years), mature ewes with good care will produce a 175% lamb crop with each lambing. Lamb birth weight is 7-8 lb. Ewe lambs of good frame may be bred at 7 months to lamb at 1 year of age, and will produce a 150% lamb crop. Yearling ewes will have smaller lambs that average a 5-6 lb. birth weight, but if bred young are more productive as adults. St. Augustine lambs are vigorous with good nursing instincts. Lambs grow well and produce meat with a mild flavor.